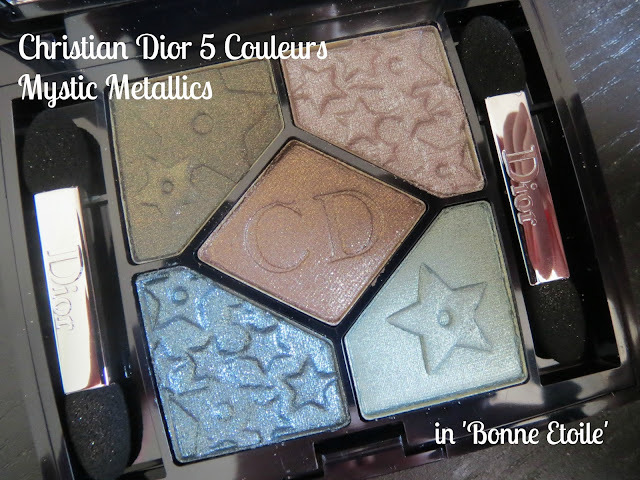 Dior's 'Mystic Metallics' collection for Fall 2013 is definitely up my street when it comes to the shimmering metallic textures and shades and the 'Bonne Etoile' eyeshadow palette is the first release (in the US) from the range. 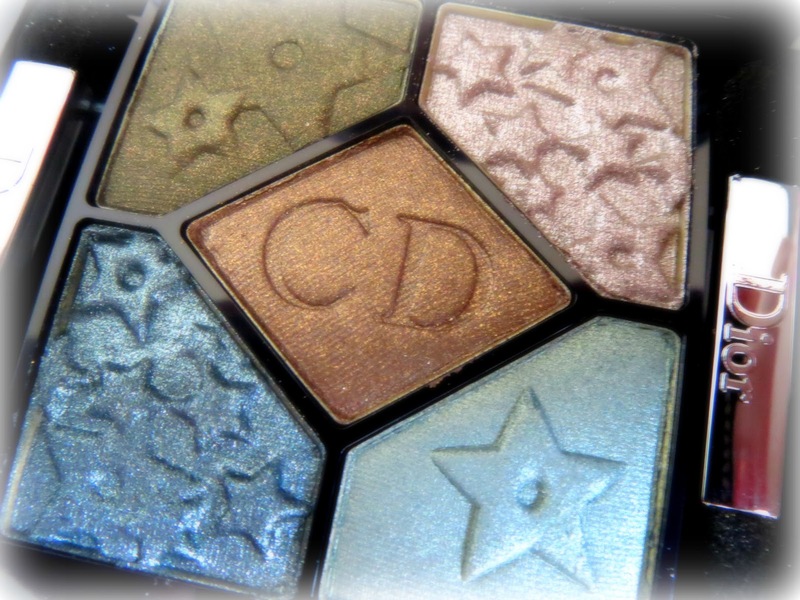 And what a way to launch the collection-I am in love with this star embossed palette. It's almost too pretty to use. I have long been a fan of Dior's eyeshadows-they're buttery soft yet pigmented and very easy to apply and blend. They feel and look high end and I have never been disappointed with a Dior palette. I always go for the metallic or satin finishes over the matte finishes. All of these colours are shimmery-my personal favourite texture and finish-they have a similar texture to what you expect from the Mac Veluxe Pearl, Stila, Urban Decay and L'Oreal Infallible eyeshadows. You can apply these shadows wet or dry. The top left is a deep khaki gold colour with tiny microglitter. It reminds me of Mac Greensmoke in colour and texture. In some lights it can appear almost charcoal-y with a green shimmer and will be a shadow I use for evening. It's much prettier in real life than it appears on my photos. Top right is a shimmery mauve/pewter colour and the lightest of the five. I LOVE the embossed stars on this section. This is the most glittery colour of the 5 but there is little fallout when applied. It works well as a base colour over the lid and this colour really intensifies when applied with a damp brush. The central 'CD' embossed shade is brown with golden shimmer. Of the 5 colours, I feel this is probably the one I have the most dupes for in my collection already-but obviously it is the sort of shade I love to have numerous versions of it!! Mac Woodwinked springs to mind, and the paint pot Eclair in a cream format. I am sure I will get a lot of use out of it. The bottom right is a sea green with a good golden metallic undertone when swatched. Blends really well with the khaki colour. Finally is a stunning blue/green teal. Again a very metallic finish which is heightened when swatched with a damp brush. This has a silver undertone to it and really is gorgeous. All the colours are quite complex and look different in different lights. That's what I love about the quality and finish of these type of shadows and the fact that you can get different effects just by dampening your eyeshadow brush. I am an absolute sucker for anything duochrome and these beautiful swatches on The Beauty Look Book here give a good reflection of how versatile this palette is-I can see me getting so much use out of this even right up to Christmas.